We started this journey as Gates Rubber Company in 1958 using the same rubber faceplate we still use today! Over the years, our owners and name changed a couple times until 1994, when the Tegra family bought the company. In 2001 our name officially became what it is today, Sioux Rubber & Urethane. But since the beginning, Sioux Rubber & Urethane has earned a reputation in the industry for being an on-time supplier of high-quality rubber and urethane applications, products and custom designs. We deliver in seven days, have a 99.998 percent order accuracy rate and a failure rate of only 2 in 7,282 orders. We even created our own proprietary blend of urethane, Endurawear. This custom blend is used in many applications like our famous HawkPad die-cutting press, patented Tuff-Tube® spout lining system, for spraying on rollers and pulleys and custom applications. Our rubber and urethane products help the mining, aggregate, agricultural, chemical and manufacturing industries by providing abrasion and wear resistance that extends the life of equipment – in the end minimizing downtime and saving our customers money. We’re also coming up with new projects in new fields to help reduce abrasion, like refinishing tanks and working with gold mines in Africa. Located in Sioux City, Iowa, our Midwestern location and old school values translate into better service and support for our customers. To us, extraordinary customer service is a standard, not a goal. 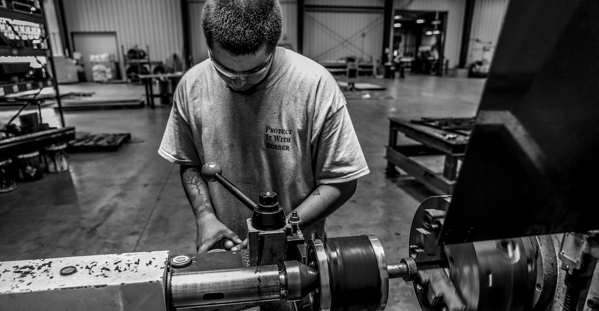 We work with all types of customers ranging from OEM’s to small town repair shops and can provide our application and manufacturing services in both large and small quantities. Rubber and urethane are remarkable products that can be applied or bonded to an unlimited number of metal surfaces and molded or cast into virtually any shape. We know there are more uses out there just waiting to be developed and we’re excited to figure them out! We specialize in solving impact, abrasion and corrosion problems by offering the answers and products to protect your equipment and streamline production costs. Some of our best products have come out of creating a solution for a customer. We can analyze your production process and show you how we can smooth the way to greater productivity, lower costs and bigger profits for your business. Thanks for working with us for these last 60 years and to continue trusting us for the next 60!